Now that it’s behind us, I’ve had some time to reflect on the “best & worst” of this season’s holiday shopping, both from a personal and news making perspective. Amazon – enough said. This online giant continues to impress. Not only are they rock solid with their delivery, especially for Prime Members, but they did a couple of other things to impress this season. Maybe I was in the dark on this, but a couple of items I purchased offered a free ONE day delivery as opposed to two. What I thought was already great was just made better. I also liked that the site was very clear with items that may not arrive by Christmas, to give customers an option to select something else on their shopping list. Way to go, Amazon! Kohl’s and the long, yet streamlined, lines: my early start to shopping did not yield a stressfree week leading up to Christmas. It appeared, after checking my list, I forgot a few things. And it was December 22nd. I went to Kohl’s that evening, dreading what was sure to be a long wait to get out of there. I was pleasantly surprised though – they seem to have enhanced their lines for the registers. When I stepped into line, it seemed to be never ending, and I settled in for the wait. However, it moved very quickly, and I was out the door in record time, but not before I was hit with yet another surprise. At the register, the cashier asked if I brought the flyer I should have received with the “secret” discount, revealed at the time of purchase. I completely forgot to bring it with me, yet the cashier was kind enough to give the highest percentage off my purchase. What a nice surprise! 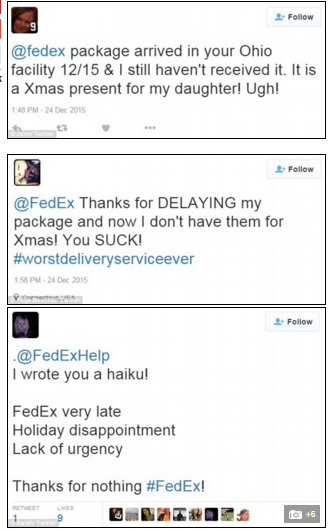 Poor FedEx: while I did not experience this personally, this news item was making the rounds on Christmas Eve. With many customers making last minute purchases, coupled with the extreme weather we saw in parts of the US, the company could not deliver on time, and many customers did not receive their packages before Christmas. It looks like social media blew up as well, with many unhappy customers. To make things right, FedEx opened its pickup centers on Christmas Day from 9am to 1pm, and several employees volunteered to work on Christmas Day to get packages delivered. It sounds like things were on schedule until the perfect storm (partially literally) hit the company. Oh Toys R Us, if nothing else, you’re honest: I rarely shop at Toys R Us anymore, partially because my kids are older and partially because I don’t always have great experiences with them. I did, however, place an online order with them. I received the email confirmation okay, but a few days later, when I went to check the status of my order online, I saw a note that there was a problem with my order and to contact customer service. First of all, why was this not mentioned in the confirmation email? Or a separate email? Had I not looked, I may not have noticed there was an issue. So I call the customer service number and am quickly met with a recorded message saying that, due to the holiday season, callers may experience a longer than usual wait. No problem – I totally get it. I put the phone on speaker, put it down, and continue with what I’m doing while I wait. No big deal. A few moments later, the recording is back, now saying that wait times may be in excess of 45 minutes. 45 minutes! Sounds like the company needs some additional staffing during the holidays. I did wait for 47 minutes, but somewhere at the 35 minute mark I noticed that live chat was available on the TRU website and used that. I did not end the call during this time just in case my issue was not resolved during the chat. It was, and all was well. Had I had more time that day, I would have remained on the line just to see how long it would eventually take. But I didn’t have time, and figured I would free up my wait to help another customer who was patiently waiting. Those were the highlights of my holiday shopping this year. What about yours? Did you have any great, or not so great, shopping moments? Please feel free to share in the comments below – we’d love to hear from you!